This Snickers Chocolate Martini tastes EXACTLY like a snickers in liquid form! Decadent, rich, and creamy with notes of chocolate and caramel, this Snickertini is the adult way to eat candy! Plus a recipe for easy, microwave homemade chocolate sauce to decorate the martini glasses! This post was originally published in October 2016. I edited the photos and updated the post below to include more information about this candy cocktail. Plus, I added a recipe video to show you how easy this Chocolate Martini is to make! Hi lovelies! Happy T-minus 4 days until Halloween!! Aka, only a few days until you can raid your children’s trick-or-treat bags and steal all the GOOD candy. Basically, only 4 days until spook-tastic times will be had by all. Wahoo! So tell me, are you dressing up? Do you plan on letting your hair down and painting the town red? Possibly hitting up a party for some festive fun? Or maybe you are more low-key, and just plan on taking your chitlens, dressed in their adorable duds, around the ‘hood? Do share! I love hearing what you guys are up to! Plus, Boy and I are hermits, so I need to live vicariously through you. Our big plan is to stay at home dressed in our jammies and binge watch Halloween specials on TV. Did you just call me lame?? Yeaaaa, I can’t even defend myself there. However, we will be kickin’ back a few of these festively fun cocktails. So you see, we aren’t completely and utterly dull. You guuuuuuys!!! THIS COCKTAIL!!! It tastes EXACTLY like a snickers in smooth liquid form. And with a boozy touch, of course. This snickertini recipe is sinfully decadent, ridiculously rich, and perfectly creamy with heavenly notes of chocolate and caramel. Basically, this cocktail is LIFE, my friends. Or as Boy says, this cocktail is Halloween in a glass. Seriously, who needs eat candy when you can drink it!? Okay, so maybe you still need candy. But you definitely need a pitcher of this caramel chocolate martini on the side. 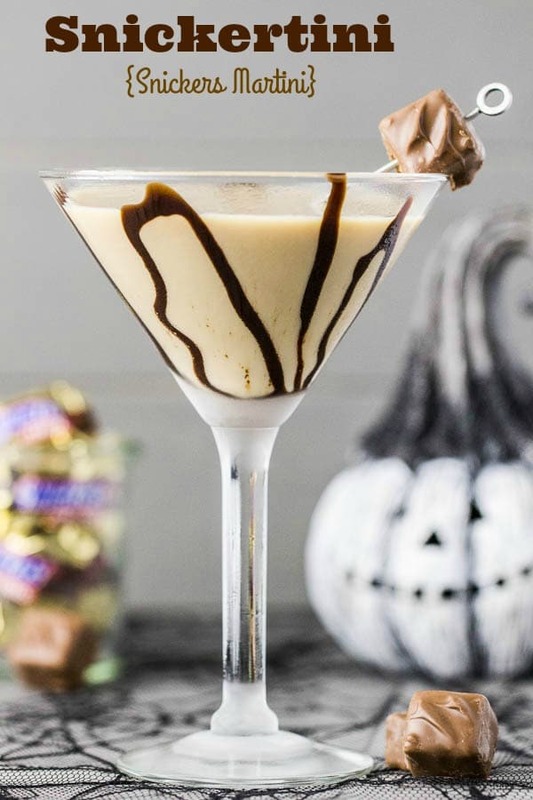 What’s in a Snickers Martini? A snickertini is a chocolate and caramel twist on a vodka martini. 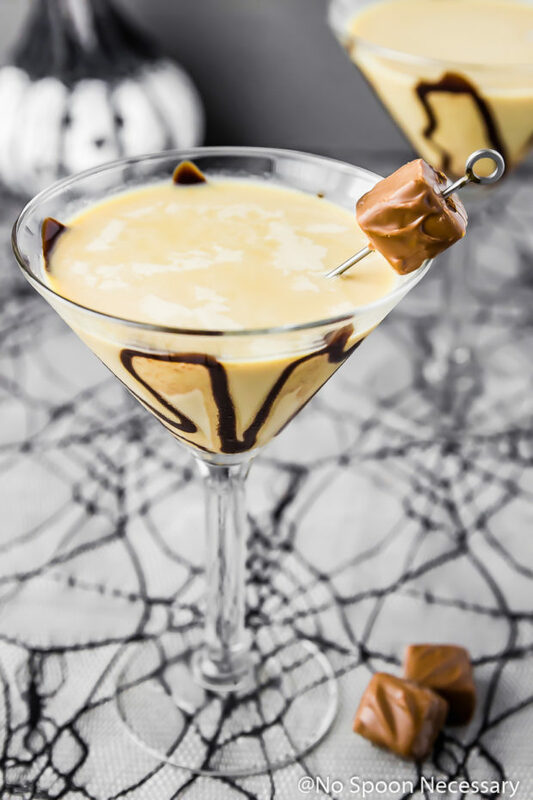 The main ingredients in a snickers martini are caramel vodka, Irish cream, chocolate liqueur and amaretto. I used caramel flavored Irish Cream in my martini to give it an extra caramel kick, but you can use plain ‘ole Irish Cream if that is what you have on hand. This dessert martini recipe calls for a splash of half-and-half; you can use either fat free or regular if you like. If you want your cocktail a little less strong, simply add more half-and-half. If you like your cocktail stiff, skip the half-and-half all together. To decorate the inside of the glasses, I like to use chocolate and/or caramel sauce. Simply drizzle the sauce(s) on the inside of the glass and then place the glass in the freezer for at least 10 minutes. This step is completely optional. 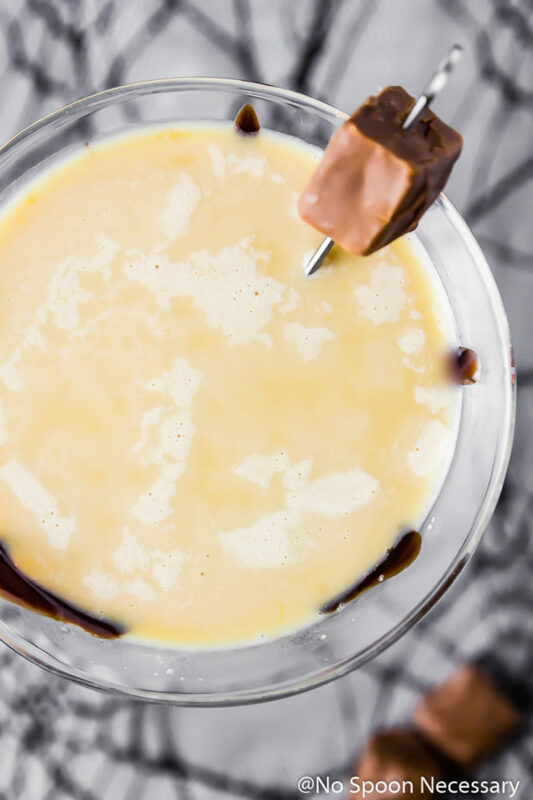 If you would like to make your own sauce, I have included an easy, microwave homemade chocolate sauce recipe in the notes section of the snickers martini recipe below. I didn’t take any photos of this, but whipped cream is a delicious garnish for this chocolate martini, along with some coarsely chopped snickers bars. 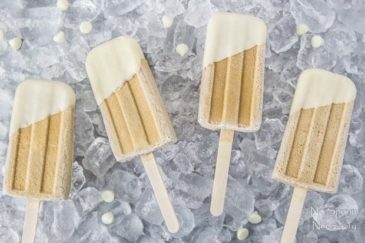 Add these ghoulishly good Snickertinis to your Halloween bash, I pinky promise this dessert cocktail won’t disappoint! Side note, since Halloween falls on Monday I will be taking the day off from posting. I hope you guys have a wickedly spooktacular Halloween! Until next Thursday friends, Cheers – to double, double, toil and trouble… and snickers in chocolate martini form. 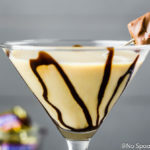 This Snickers Martini tastes EXACTLY like a snickers in liquid form! 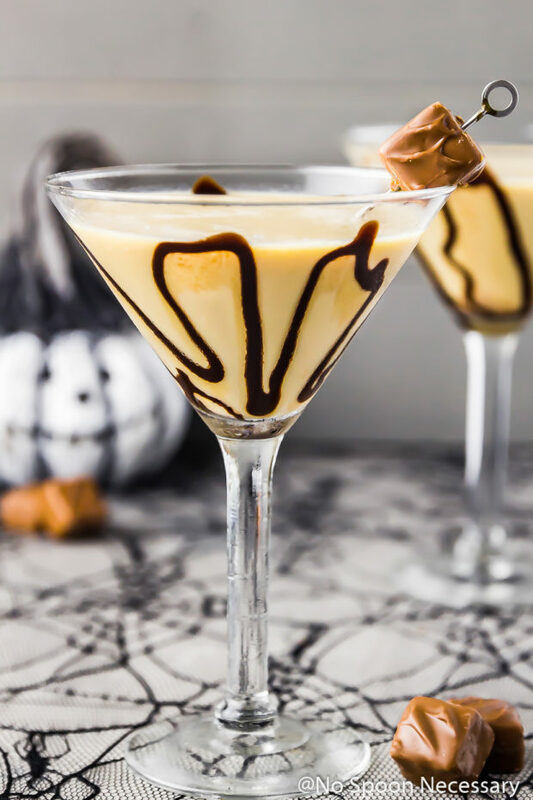 Decadent, rich, and creamy with notes of chocolate and caramel, this Snickertini is the adult way to celebrate Halloween! Optional: Drizzle vertical lines of chocolate and/or caramel sauce on the inside of 2 martini glasses. Chill in the freezer until ready to use. For the cocktail: Add all ingredients to a shaker and fill with ice. Shake until chilled and strain into martini glasses. 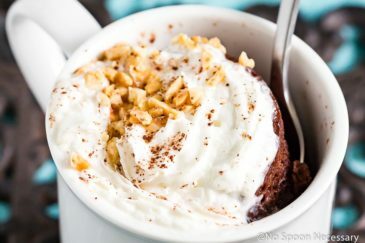 Garnish with whipped cream and mini snickers. Enjoy! I used caramel flavored Irish Cream in my martini to give it an extra caramel kick, but you can use plain Irish Cream if that is what you have on hand. To decorate the glasses, I like to use chocolate and/or caramel sauce. Simply drizzle the sauce(s) on the inside of the glass and then place the glass in the freezer for at least 10 minutes. You can skip this step if jazzed up martini glasses aren’t your thing. I have included a homemade chocolate sauce recipe below, but feel free to use store-bought. I didn’t take any photos of this, but whipped cream on top is an excellent addition, along with some coarsely chopped snickers bars. Microwave 1.5 ounces of chocolate chips with half-and-half at 50% power for 30 seconds. Stir. If chocolate isn't fully melted after stirring, microwave again at 15 second intervals, stirring until fully melted. Add in the remaining chocolate chips and stir. Set aside to cool before using. Talking about Halloween candy…I don’t know why we did it so early, but we bought a bag of treats today. Certainly, we needed to sample (only one or two sweets, I swear) it. It looks like we need to get more candy. And this luscious fancy coctail has been one of the most favorite creations of yours. Seriously, how did I miss this the first time around?! It looks deadly Chey! 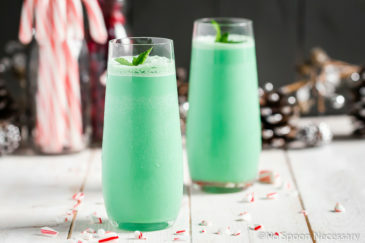 Such a great signature cocktail for the upcoming holidays! Hope you have an awesome week! Cheers! I’ve never been one for sweet drinks but I’d 100% make an exception for this beauty. Snickers are one of my FAVORITE EVER candy bars and I love your idea of having a pitcher of Snickers martinis alongside my beloved candy. In fact, I think I’ll do that for Halloween; it will make Cookie’s incessant barking at the doorbell far more pleasant :). Have a great week, my dear! Definitely didn’t know caramel vodka existed – now I HAVE to have it! I love the photos (especially the outer chocolate drizzle)! 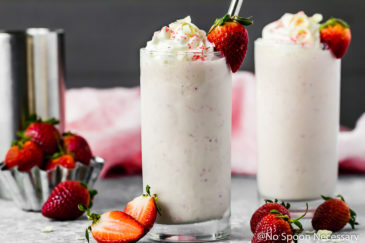 This looks like my kind of cocktail! OMG! You are such a tease! 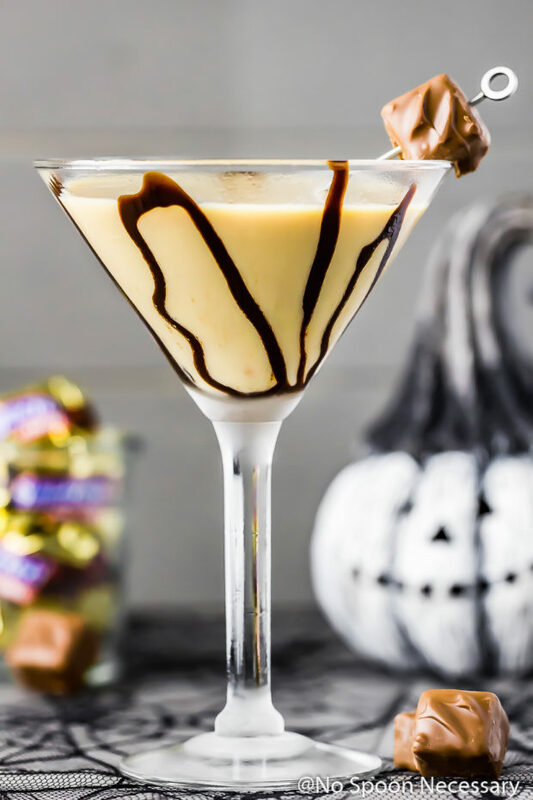 Snickers are my favorite Halloween candy and making it into a boozy martini is almost too much for the pregnant gal to take! This one will have to go in my little folder (which is growing all the time) of things I can’t have now, but must have post baby!